When people think Victoria, BC they think sunshine, flowers, Victorian, Emily Carr and afternoon tea. 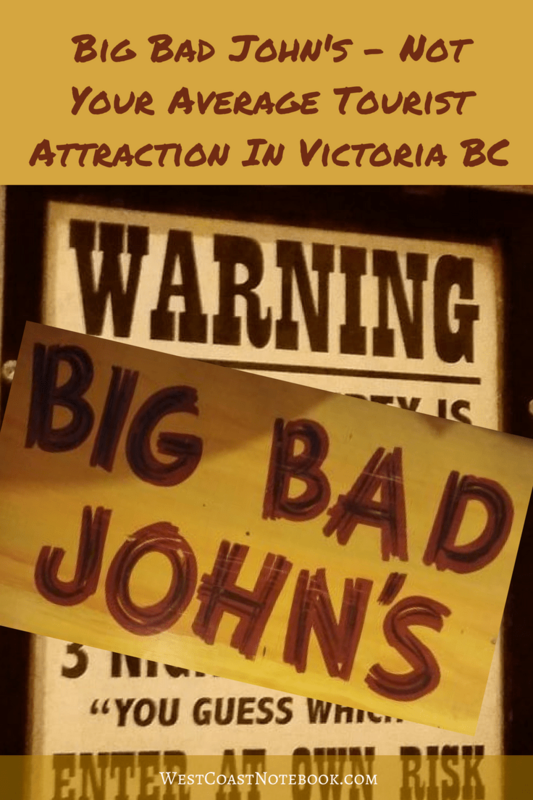 But… there is another side to Victoria that most people don’t see and it comes under the heading of “Big Bad John’s“. After living in this area for more than 15 years it wasn’t a place I was familiar with either and it took out of town friends to expose me to the worst or best of Victoria’s nightlife. I say worst or best because depending on how you look at it, it could go either way. Before starting the story I must punctuate it with my drinking habits which are nil to none. I have been known to have an occasional glass of wine or a sip of a cider from Rob’s glass, but basically I just never acquired a taste for alcohol. That said… heading out on a pub crawl in Victoria wasn’t high on my priority list. But friends were coming down from up island so we met them in town to see the sites. We stopped at our favourite restaurant which is a little sushi place called Ebizo‘s. If you are looking for the best sushi that you’ve ever eaten, then Ebizo’s is the place to go. After dinner, we met up with our friends and they were way ahead of us on the pub crawl as they had been in town since the night before. We headed over to the Sticky Wicket which is what you would expect a Victorian pub to be like. Lots of brass, wood, beer on tap and comfy seating. You can see a virtual tour here. What I didn’t realize until later was that this was all part of a larger complex called the Strathcona Hotel in which there are numerous venues. Two of the people in our party came back from using the facilities and mention Big Bad John’s. They talked about all the paraphernalia on the walls and the stuff hanging from the rafters. I was only half listening until I heard the word “bras” and then my ears perked up. It appears that on the way to the washrooms there is this little hole in the wall bar that has been there since 1962. So a couple of us went to have a look see. Looking into the bar all you could see was like a hallway with “stuff” everywhere on the walls on the floors and on the ceilings. The walls were lined with notes, bills, cards, ID and pictures. The floor was covered with peanut shells and the ceiling was alive with bras of every size and shape. Took one look and thought… I don’t think this is for me and we went back to our seat in the more civilized bar in the Sticky Wicket. But… it wasn’t long before one of the guys from out of town decided that his holiday wouldn’t be complete until we went to Big Bad John’s. So, being in the flow, off we went. When you enter, it’s sort of like entering a train car. Not very wide or long with benches and tables along the side. Here is what the Times Colonist had to say about it. The bar has existed since 1954. The Strathcona Lounge was the province’s first post-prohibition cocktail lounge, but took on the Big Bad John’s persona in 1962 when John Olson created a hillbilly hideaway in anticipation of a stream of visitors in the wake of the Seattle World’s Fair. 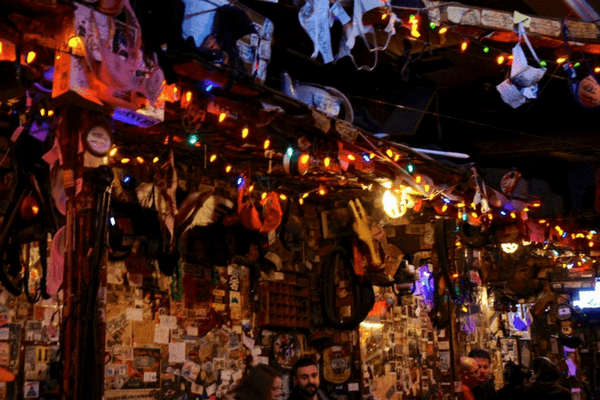 The bar is famous for the organized chaos within its walls, with peanuts strewn across its small tables, floors and burlap-sack-upholstered benches, and a wild collage of IDs, underwear, money and memorials tacked to the walls and table tops. And for those not paying attention, plastic animals and insects, controlled by fishing line from behind the bar, are dropped with regularity at every table. There were 7 of us in our party, so we all crammed into a bench seat along the wall with those on the outside hanging on. Peanuts come in kiddies sand buckets and you throw your shells on the floor. You can get any type of drink there, but it smells like the beverage of choice was beer. I was trying to figure out if one just brought their bras in or if one took them off there and threw them up on the beams. One of our group offered to cover the ladies while we took ours off, but we declined the offer. Music was great. Old rock ‘n roll and country. 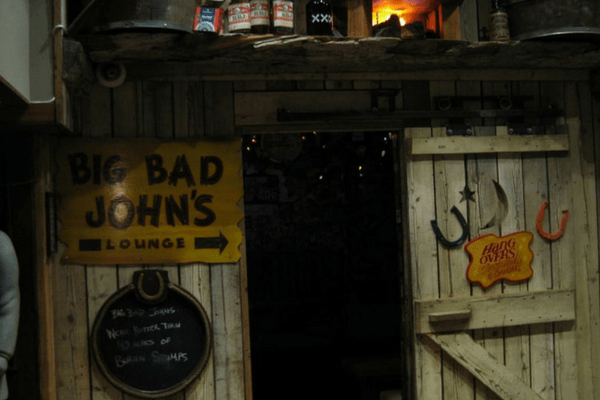 After all, it’s not called the “hillbilly bar” for nothing. You could spend hours just sitting, reading the walls, tables and beams (yes there is “stuff” all over them) and trying to figure out which bra has the largest cup size. It’s the type of place that you wouldn’t want to see in daylight but the dim lighting made it palatable and I even noticed the makings of a still in the corner. Copper tubing and all. The staff wear cut off denim bib overalls which fits in with the theme of “hillbilly bar” and they look like they are having as much fun as the patrons. Mid way through the first beer a large spider came down to hover over our table and gave everyone a jolt. Turns out it was a plastic spider that you see at Halloween and it’s all part of the experience at Big Bad John’s. At the first, I said it was one of the worst and one of the best bars in Victoria. After spending an evening out bar hopping, this was a refreshing experience and one that I’m not likely to forget soon. And of all the bars and pubs we went into, I’m going to put my reputation on the line and say “This was the one I liked the best”. Guess I’m just a hillbilly at heart.